Finally all the bookings flight, hotel are already completed. Now you are ready to check out for your holiday. But suddenly you found that you didn’t sort everything with the travel insurance company. 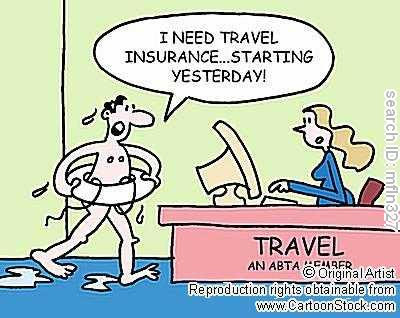 This is basically applicable for those who are using the travel insurance for the 1st time. Now the question is from where you will take your travel insurance? From where you will get the maximum coverage with a minimum payment? How you will judge the facility or the coverage? So, here you can get some hints below. 1. Don't think you can travel without it. If you will take travel insurance it will make your journey more peaceful & secured too. 2. I think those who are the frequent traveler they need to take travel insurance. It will be very much economical for them. 3. What type of traveler you are? It is also important to choose the travel insurance. If you are traveling with the whole family then there is no need to go for same accident coverage which you will take if you will go for any professional tour. 4. Search around. Before going for any insurance you need to search through out the market. From there you just grab the best one. 5. Rules & regulations need to look carefully. Just go through all the rules & regulations of your travel insurance then sign the deed. Now, I am wishing you a very happy journey with the coverage of your travel insurance policy.